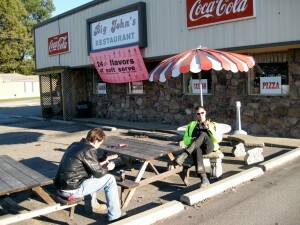 We rode for about 3 hours on Sunday in Crittenden County, just over the Mississippi River from Memphis. I wanted to show the guys something interesting I found a month or so ago, which is the exit point for the original automobile traffic bridge over the Mississippi for the area. 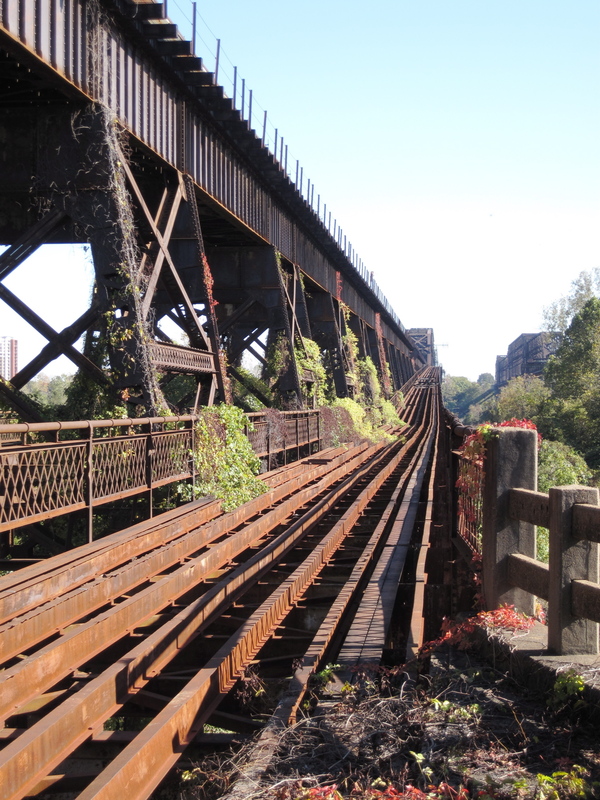 It is located right next to I-55, on a old railroad bridge where they bolted steel girders onto the bridge and covered them with huge wooden planks almost the size of railroad crossties. You can’t see any wood in this shot (it has all rotted away), but you can see what remains of the bridge as it arches up and prepares to go east over the river and toward Memphis. It was a beautiful day to go riding, needless to say. We ran into a really nice guy from Midtown out riding on the dirt roads with his girlfriend, and he took us to a nice spot opposite Memphis, evenly between the I-40 and I-55 bridges, almost even with the end of Mud Island. We all enjoyed the view of downtown, and while the river was rising, it almost looks so calm as to be swimable. Here’s a shot of Wisch and the scene across the river, back toward Memphis. We got deeper into the mud that afternoon, going all of the way from I-55 to a road north of Marion entirely on dirt (well, dirt, mud, deep puddles, and lots of fallen, wet leaves). The ride was challenging but rewarding, and we all got adequately lost and dirty. 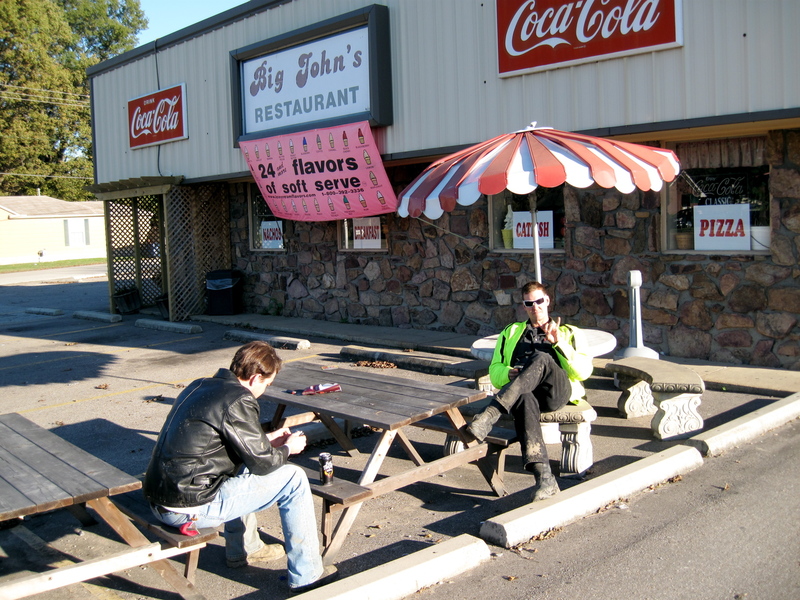 We ended up taking a rest in Marion before heading back over the I-40 bridge back to Memphis. If only Big John’s had been open. 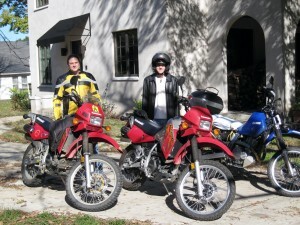 If you are looking to read about an incredible adventure motorcycle trip, please read their ADV Rider thread. Yes, I know it is over a hundred pages long, but the hours spent will be worth it. If you only have 10 minutes, just read a few pages, perhaps of their ride from this summer. In summary, some truly crazy (and very brave) guys traveled from Poland to Magadan in Eastern Siberia in 2007, and this year, they explored a big chunk of Eastern Siberia, usually without even the benefit of roads. They didn’t let the isolation of the area, or the bears, or the lack of fuel or spare parts, stand in their way. This looks to be an amazing adventure, and they are still publishing pics from the summer ride daily. Truk, I *swear* I remember driving across that I-55/railroad bridge as a kid/teenager. 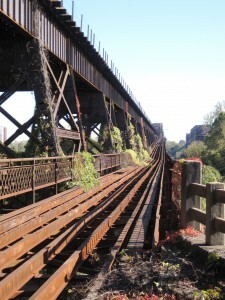 My dad called it “the old bridge.” I remember thinking it was odd even then. Is my memory reliable? Any idea when it went out of service? 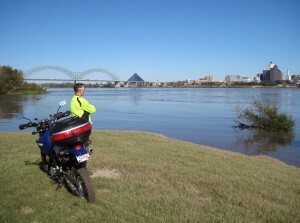 With your permission, I would like to use the photo with your bike in the foreground and the Ms River and Memphis in the background. 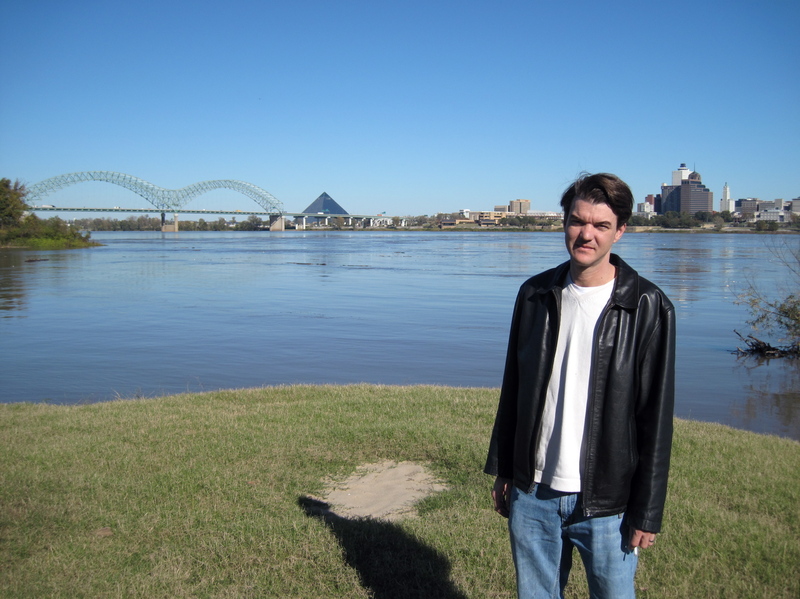 Working on a project to put a bike/ped boardwalk on the Harahan bridge and develop a riverpark on the Arkansas side where you took the photo.